I am happy to report that after switching back to tea tree oil, my nails are looking fantastic again. I am so glad I switched back. Tea tree oil all the way! The right big toenail which has been so problematic is really showing progress again! Woo hoo! This gives me hope the fungus isn’t going to grow resistant to it and start taking over again. 🙂 I can’t wait to share my next update! I also wondered if my toes were more resistant. This was great. Tea tree oil has been great, but patience is the key. Good to see your update John! Your nails are looking good. My update is that I seem to have beaten the fungus! Very pleased about that. For me it was just TTO and coconut oil twice a day. Thanks for the link to the study. I too had been wondering whether my athlete’s foot would grow resistant to tea tree oil. I have been using it since September 2016. For the last 3 months I have managed to keep the fungus at bay by daily washing my feet and applying TTO between my toes. I put tissue paper between my toes after washing them and before applying the TTO to ensure that they are completely dry. So far no recurrence. 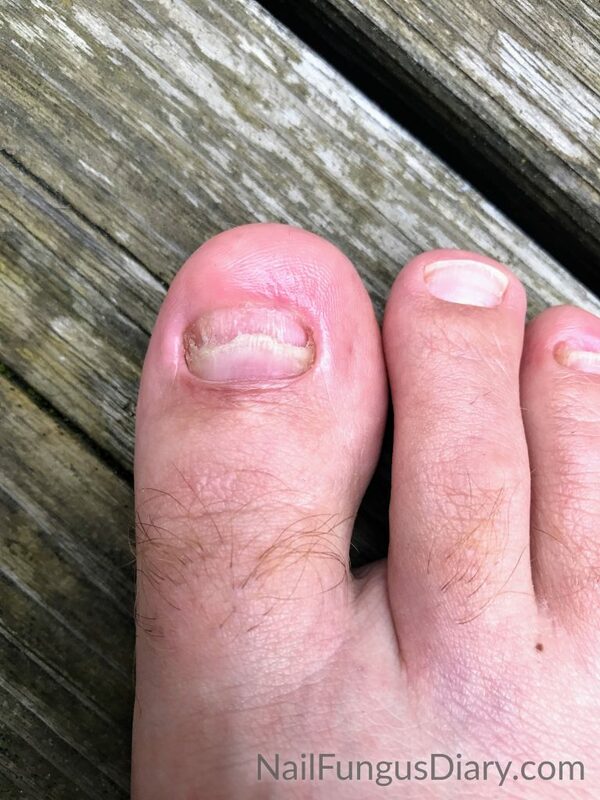 The athlete’s foot had been very very resistant to over the counter medication in the UK such as terbinafine and the doctor prescribed Daktacort gel which finally did the trick. Otherwise she was going to send off skin scrapings to the lab. My partner is the one with the nail fungus and his nails are finally growing back fine. I caught a little of the fungus on my 2 big toes from him but seem to have managed to treat that with Loceryl. He also is using Loceryl and I try to get him to use the TTO as well. I am pretty sure that all these toe infections originated with him not treating his athlete’s foot. His nails were dreadful until I insisted he treat them which was a pity as he has nice feet. Getting him to change his socks regularly is still an ongoing struggle. I have a 20 year plus infection. I’ve been using your guide for about 9 months now. Finally method that actually shows some progress! I have to say my toenails look tons better than they have in years, I actually dare go barefoot at times in public, if I’m barefoot, I don’t immediately run for footwear when someone comes near. At the same time, I can’t believe the stubbornness of this infection. I went into this originally thinking maybe a year of work and I’d be fungus free. But watching your progress and setbacks, the clearing followed by blooms of infection, the far from linear results, and knowing I’ve been having nearly the same experience. Many times thinking it’s gone for good only to have reinfection, below the progress line. It’s a war of attrition, slowly but surely I’m reducing the numbers, I win some, I lose some, but the net seems to be a gain. This is an extremely tenacious infection! I have found the folds of skin along the sides of the nail seem to be particularly stubborn. I have seen good clearing for several months in a row only to see the infection start again along the side of the nail due to a deep pocket of keratin debris. I cut back and dig along the side, then start making progress again. It sounds barbaric, but I’ve found a Dremel tool to be extremely helpful in cleaning things up. I can’t believe how hard the Keratin is. I’ve decided this time I’m going to win this war. I’m going to stay the course and keep going until I’ve completely eradicated this infection. Good luck to you too! After 9 months of using your guide, my nails are in nearly the same shape as yours, this give me hope while at the same time realizing the battle we’re all in for.